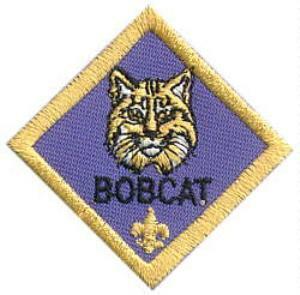 The first rank for any Cub Scout, regardless of age, is the Bobcat. To earn the Bobcat badge, the Cub Scout will learn the Cub Scout Sign, the Cub Scout Promise, the Cub Scout Motto, the Cub Scout Handshake, the Law of the Pack, and the meaning of Webelos. 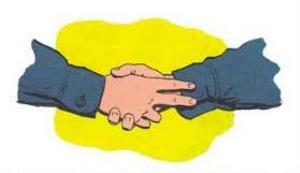 The Cub Scout handshake is made by extending the RIGHT index and middle fingers, and placing them alongside the wrist of the person with whom you are shaking hands. 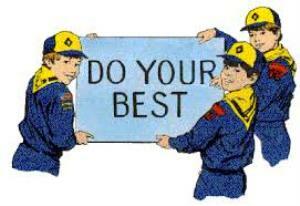 The Cub Scout sign is made with the RIGHT hand, making a V with the index and middle fingers. The sign signifies a wolf's ears, and reminds everyone to "Listen up!" When you see this sign, you should stop talking and pay attention, and make the sign yourself.